Inui Health, formerly known as Scanadu, has announced the launch of the first clinical grade home urine analysis platform. Such tests were previously available only at a lab or medical facility. 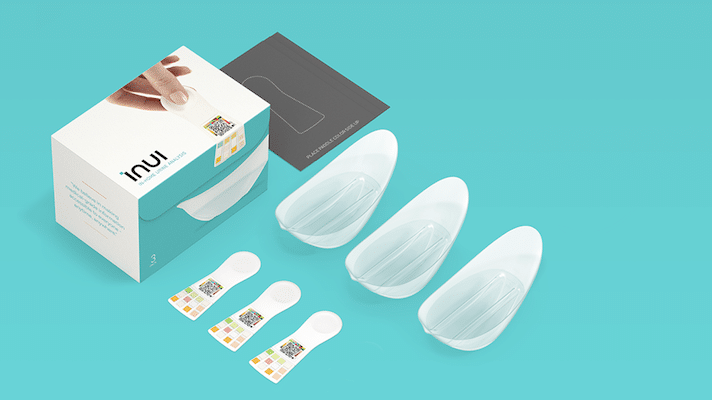 The FDA-approved kit consists of a disposable test and smartphone app. Those of us who’ve followed wearable tech for a while will recognize the name Scanadu. The company made a name for itself with Scout, a Star Treck-esque device that could check for heart rate, blood pressure and body temperature. Ultimately the medical startup failed to secure FDA approval and shut down support for the product. This in turn sparked lots of anger from customers who bought the device. Scanadu is back now under a new brand. We know the company was working on a urin analysis product called ScanaFlo for a number of years now. The Inui platform looks to be that product. The whole thing is very simple to use and far more convenient manner than traditional urine analysis methods. Users will need to fill the single-use cup with urin up to the required level. The next step consists of removing the measuring paddle from the pouch and dipping into the liquid. Finally, place the paddle color side up on the gray background sheet and scan the readings with the smartphone app. Test results are captured by colorimetric analysis and interpreted and displayed in less than a minute. The app shows info on Protein, Glucose, Leukocytes, Nitrites and Ketones. The Silicon Valley outfit says these metrics can be used to monitor general health, kidney function, metabolic disorders and screen for urinary tract infections (UTI). Users can also share their results via a HIPPA compliant system with their doctor. This is not the only such kit on the market cleared by the FDA. Healthy.io and Scanwell have also popped up with similar products in recent years. But the Inui platform tests for more conditions and its more convenient as the results do not need to go through a medical professional before users can see them. “We are entering a market that has a few competitors with limited offerings, but none of them have received the type of FDA approval to deliver such a wide range of diagnostic results to both patient and physician simultaneously with our convenience and low cost,” said Reza Kazemipour, Chief Revenue Officer at inui. The test certainly sounds much more convenient than traditional urine analysis. Inui Health says the urine platform will soon be able to detect and monitor for other health conditions. Presumably this will be enabled via updates to the smartphone app. The 3-pack system can be picked up at www.inuihealth.com, for $34.99. The company also kits consisting of 5, 10 and 20 packs. ← Which Withings fitness tracker is right for me?